As tough economic times affect marriages everywhere, the divorce process is changing. Divorces are on the increase, and 95 percent of cases are settled prior to a judge deciding the outcome. yes, the means yours, too, can be resolved without emotional and financial devastation. Professional mediation is the alternative that will save couples money and time, and can reduce the stress of uncertainty associated with divorce and its processes. In approaching divorce, people want to know that they will have an advocate, someone to represent their concerns. 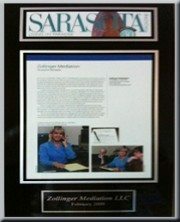 At Zollinger Mediation, LLC, that’s exactly the service that is provided to both parties, in order to make the process as fair and as amicable as possible. As a Florida Supreme Court-certified mediator, Freya Robbins and her staff provide the environment and support for a couple to create their own agreement, within the bounds of the law. in addition, Zollinger is a certified divorce financial analyst, which means that all financial aspects of the divorce process are measured and evaluated prior to making any final decisions. “It’s not necessarily easy,” responds Zollinger, who has been advocating for couples this way for almost five years. “But it is feasible.” After all, you love each other enough when you married; certainly there’s enough respect to end it on a positive note.